'We are pleased to announce the 2019 edition of the DIRECTV Liga de las Americas with the participation of 16 teams from which there are 11 champions representing 10 countries, including historic basketball clubs from our continent. We thank the national leagues and participating clubs for their commitment and for being ambassadors of our sport. We in FIBA Americas are confident that this edition will again serve as an important platform for all the stakeholders to elevate basketball at the continental level and show the best our sport has to offer,' said FIBA Americas President Usie Richards. In the Group Phase, teams were divided into four (4) groups of four (4) and will play in round robin format during three (3) days. The top two teams (2) from each group will then qualify to the Semifinal Phase. In the Semifinal Phase, the eight (8) teams will be divided into two (2) groups of four (4) where they will play in a round-robin. The top two teams from each group will advance to the Final Four, where the competition champion will be determined. The Hosts of the Groups will be announced in the coming days. 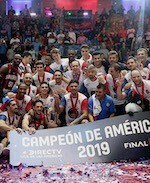 San Lorenzo de Almagro from Argentina is the defending champion of the DIRECTV Liga de las Americas, after winning the continental league at home in Boedo, Argentina.